Joomla Hosting Tips: How to Setting Cookie in Global Config? 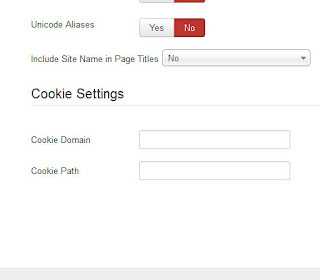 Cookie Domain : Domain to use when setting session cookies. Precede with '.' to make valid for all subdomains. For example ( .yoursite.org or .yoursite.com ). Cookie Path : Path for which the cookie is valid. In order to work in all cases, it's best if Joomla uses the cookie domain .yoursite.com" in all cases, the domain most other software expects when recognizing session cookies. Attention Please : If you don't interested about Cookie Domain and Cookie Path, you can leave this field empty. To leave this leave this field empty not affected your site. After change any kinds of settings you need to click ( save ) or ( save & close ) button from the upper left corner for saving changes. HostForLIFE offers you the latest Joomla version hosting with unlimited domain, unlimited diskspace and bandwidth. With the 1-click Plesk Panel tool installer you will have installed Joomla in a couple of minutes with no complex settings and necessary technical skills. To see more information, you can go to our review.